In development for over three and a half years, Night in the Woods came out last week and has been making waves with its unique art style and intimate take on daily life in a small, stagnant town. The game’s soundtrack, which Riley MacLeod called “intensely beautiful” in Kotaku’s review, is a big part of that. The person behind the music is Alec Holowka and this is his desk. 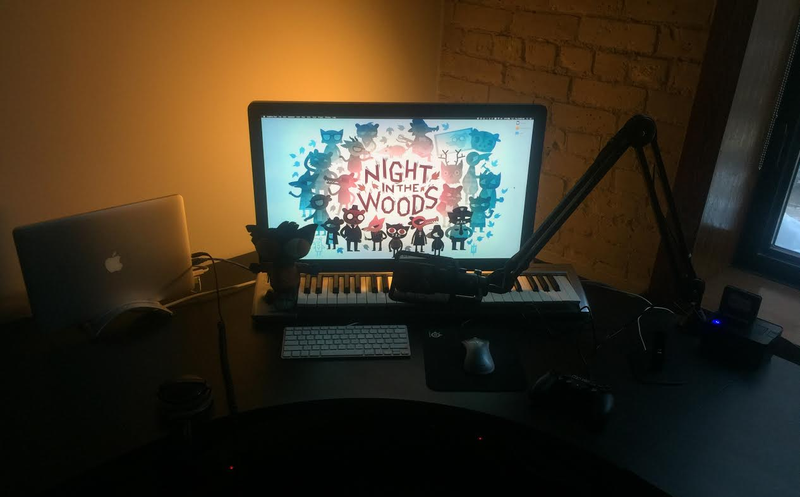 The designer and composer behind a number of other games, including Aquaria and I’m O.K – A Murder Simulator, Holowka has founded a number of small development companies and collaborated with lots of different designers, including most recently Scott Benson and Bethany Hockenberry for Night in the Woods. I asked Holowka what his work space was like and he offered the above picture of his apartment in Winnipeg, Canada. On top of the L-shaped desk sits his 2013 MacBook Pro along with a Retina + Thunderbolt display. Next to both sits a MIDI keyboard wired to a pedal that sits under the desk so he can switch between coding and composing on the fly. It’s the kind of clean and unassuming setup you might expect given some of the music it’s produced. I’ve always been very interested in how people work, play, and create, as well as the spaces they choose to do those things in. I’ve reached out to a number of people to doing interesting things in gaming, whether making them, competing in them, or simply playing them, starting with Holowka, who was kind enough to share some insight about his work and also answer following brief questionnaire. I’m doing okay. It’s fine. We’re gonna be okay. A can of coke. That isn’t my regular meal, but I still feel regretful about it. 3. What’s the best/worst game you’ve ever played? Blood Omen: Legacy of Kain. It’s pretty broken in hilarious ways and SUPER melodramatic, but I kinda love it. Not going into therapy sooner. Also that “having a can of coke for breakfast” thing I mentioned earlier. Whenever I’m with a group of awesome people collaborating on some kinda cool project, in person. I’ve been lucky to be in that situation a few times, I hope I can make it happen a few more times before I kick the bucket. 6. If you died and came back as a character or object from a game, what would it be? This is super embarrassing, but I wouldn’t mind being Raziel from the Soul Reaver games. He’s pretty MOODY and AWESOME.